pTYB2 is an E. coli cloning and expression vector (7474 bp) used in the IMPACT™ Kit (NEB #E6901) which allows the overexpression of a target protein as a fusion to a self-cleavable affinity tag (1,2). This C-terminal fusion vector is designed for the in-frame insertion of a target gene into the polylinker upstream of an intein tag (the Sce VMA intein/chitin binding domain, 55 kDa) (1,2). This results in the fusion of the C-terminus of the target protein to the N-terminus of the intein tag. Thiol-induced self-cleavage of the intein releases the target protein from the chitin-bound intein tag, resulting in a single column purification of the target protein. For fusion of the N-terminus of the target protein to the intein tag, use pTYB21 (NEB #N6709) or pTYB22 (NEB #N6710). This vector can be used in conjuction with pTYB22 (NEB #N6710) to test which fusion constructin (N-terminal or C-terminal) maximizes the expression and yield of a target protein (3). The SmaI site is used for cloning the 3´ end of the target gene and will yield a target protein with a single glycine residue added to its C-terminus after cleavage of the intein. 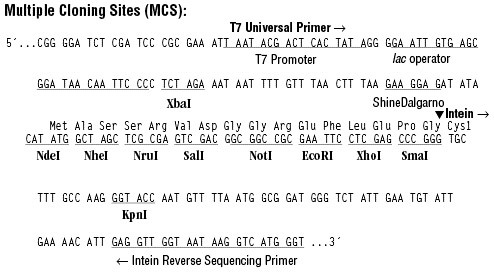 Expression requires an E. coli host that carries the T7 RNA Polymerase gene [e.g., T7 Express Competent E. coli (High Efficiency) NEB #C2566), BL21(DE3) Competent E. coli (NEB #C2527) and derivatives]. M13 allows for the production of single-stranded DNA by helper phage superinfection of cells bearing the plasmid. M13K07 helper phage is available from (NEB #N0315). Other IMPACT vectors are available which allow for fusion of a target gene to N- or C- terminus of an intein, the cleavage reaction may be induced by thiol reagent or temperature/pH shift. The sites in the polylinker region are identical to or compatible with (i.e., NheI of pTYB2 and SpeI of pTYB12) those of pTYB12 (NEB #N6902). This allows the same amplified target gene to be cloned into either vector for optimizing protein expression. Vector derived residues may be present at the N- and/or C-termini of the target proteins. Companion vectors (pTYB1, pTYB3, pTYB4) differ only in the sites present in the polylinker. Chong, S., Mersha, F.B., Comb, D.G., Scott, M.E., Landry, D., Vence, L.M., Perler, F.B., Benner, J., Kucera, R.B., Hirvonen, C.A., Pelletier, J.J., Paulus, H. and Xu, M.-Q. (1997). Single-column purification of free recombinant proteins using a self-cleavable affinity tag derived from a protein splicing element. 192, 277-281. Chong, S., Montello, G.E., Zhang, A., Cantor, E.J., Liao, W., Xu, M.-Q. and Benner, J. (1998). Utilizing the C-terminal cleavage activity of a protein splicing element to purify recombinant proteins in a single chromatographic step. Nucl. Acids Res. 26, 5109-5115.